My name is Tammy Chilleme, my dog Kaiah is a 3 year old resue dog, rotti mix that we have had since she was a puppy. She a wonderful disposition and enjoys wearing clothes, wont go out in the rain without her raincoat. 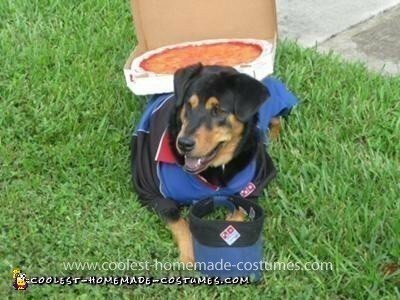 Kaiah”s Dad works at Dominos so I decided to dress her like Daddy in a Homemade Dominos Deliver Dog Costume. I altered a large shirt that was stained to fit her and allow her to go to the potty. The visor she has been wearing since a puppy added velcro to make smaller. 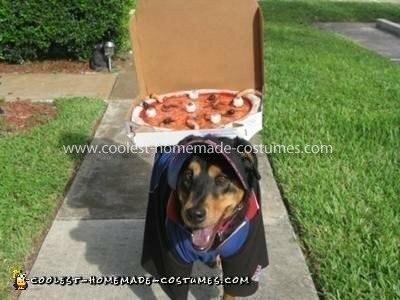 Domino’s Pizza box is velcroed to the shirt and doesnt fall off even while chasing lizards. Pizza is cardboard covered in fiberfill (so not flat) then PC photo paper. Paper was painted many layers of acrylic pain with texture medium (translucent) then several coats of acrylic spray for shine. 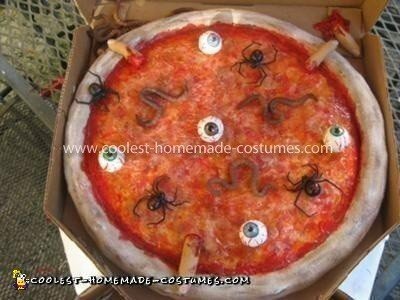 The crust is a tube of fabric stuffed then painted and glued to pizza and everything glued to box. The toppings were sculpted from polymer clay and painted. Black widow, finger, eyeball and worms. This costume is so cute…our rescue dog looks JUST LIKE YOUR DOG, they could be twins. Look up Australian Kelpie, that is our best guess as to what breed our dog is, people say rottweiler because of coloring but believe me, kelpie looks and personality are spot on. 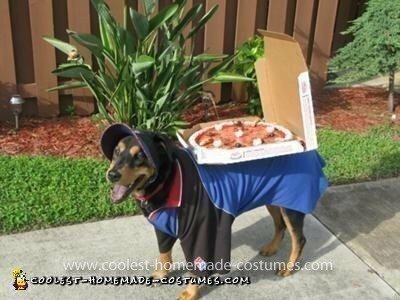 Great job on the costume!